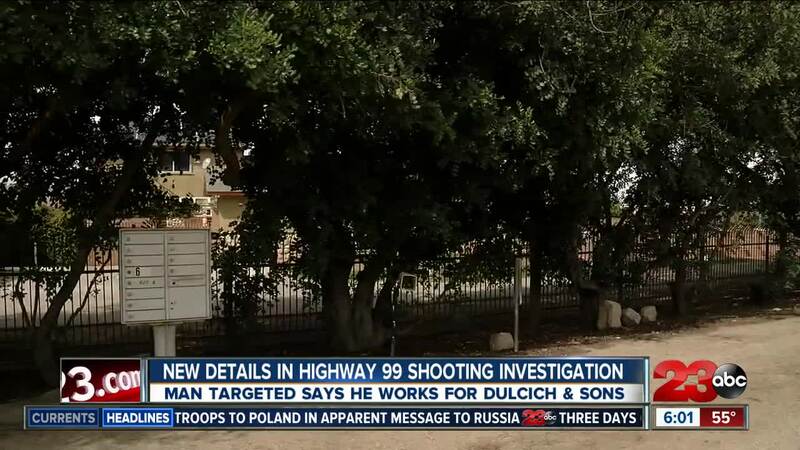 BAKERSFIELD, Calif. — A man who's home was targeted in a drive-by shooting in McFarland on Friday reportedly has ties with Delano grape grower Dulcich & Sons. According to CHP, a vehicle pulled over on Southbound 99 early Friday morning and opened fire at a home on Frontage Road in McFarland. A resident in the area said they found a bullet fragment on top of the mailbox and the shooting has many neighbors on high alert. The man who's home was shot at, Rodolfo Elizalde, told 23ABC that he was shot at two separate times while driving home from work in the past before the incident early Friday. Elizalde said that he isn't aware of who is responsible for the shooting, but told 23ABC that he has worked for Dulcich & Sons for 25 years as a former supervisor and current contractor. Jakov Dulcich, a prominent Delano grape grower was killed in a drive-by shooting near Delano in April 2018. The Delano Police Department was dispatched to the area of Woollomes and S. Browning Road for a report of a traffic collision and shooting. When they arrived on scene, they found Dulcich suffering from multiple gunshot wounds and he was pronounced dead at the scene. In September 2018, a mistrial was declared in the murder case when the jury was unable to reach a unanimous verdict against Mariano Fernandez Perez, who was charged with first-degree murder in Dulcich's death. In December, Perez was found dead in the area of Highway 155 and Wallace Road. Neighbors say that they heard two separate rounds of loud gun shots outside near Elizalde's home. One neighbor, Mari Lopez said that a bullet also hit a home a few months ago during a separate shooting that happened around the same time of day. Authorities could not confirm that both shootings are related to Roldolfo but they are aiming their focus on finding the person responsible for the shooting. Elizalde said he turned over his surveillance video from outside his home to CHP authorities in hopes that they can find the person responsible for the shooting. CHP is asking anyone with information pertaining to the suspected shooter to contact their office immediately at (661) 396-6600.